Do you know the history of barbecuing? According to Hearth, Patio, and the Barbecue Association, “There is no definitive history about how the word “barbecue” originated – or why it’s sometimes used as a noun, verb, or adjective. Some say the Spaniards get the credit for the word, derived from their “barbacoa” which is an American-Indian word for the framework of green wood on which foods were placed for cooking over hot coals. Others think the French were responsible, offering the explanation that when the Caribbean pirates arrived on our Southern shores, they cooked animals on a spit-like devise that ran from “whiskers to tail” or “de barbe a` queue’ (HPBA). 1. The most popular holidays for barbecuing in the USA are: July 4th (71%), Memorial Day (57%), and Labor Day (55%). 2. The most popular foods for cooking on the grill are: burgers (85%), steak (80%), hot dogs (79%) and chicken (73%). 3. The side dishes most commonly prepared on the grill are, in order, corn (41%), potatoes (41%), and other vegetables (32%). 4. The most popular flavors of barbecue sauce are hickory, followed by mesquite, honey, and then spicy-hot. Soak 8 small wooden skewers in water for at least 15 minutes; doing so will keep skewers from catching fire, if you have metal skewers with wooden handles, even better. There is no need to soak the metal ones. In a large bowl, toss the chicken, onion and orange with the oil, cumin, cayenne, ¾ tsp. salt and ¼ tsp. black pepper. Allow mixture in bowl to set 20 to 30 minutes. Letting flavors penetrate meat. Mean time heat you’re outside grill. Thread meat mixture onto the skewers. Spray with olive oil and lightly spray grill. Place skewers on grill, turning occasionally, until chicken is cooked through and the onion is just tender; about 15 to 18 minutes. If you want to replace the thighs with chicken breast you can do so. The chicken breast is leaner meat, and many like to shy away from the dark meat, believing it has more fat content. But keep this in mind about the thighs: They contain iron and zinc, which provide more energy for you to work out or exercise, for longer periods. Furthermore, the protein is useful for feeding and building muscle. This entry was posted in Chicken, Main Dish, Party Favorites and tagged Barbecue, Barbecue Association, Barbecue chicken, boneless chicken thighs, Cayenne pepper, Chicken, Chicken Skewers, Cook, Grilled Chicken, Memorial Day, Olive oil. Bookmark the permalink. Thanks for reading and expressing your enjoyment of the BBQ history. Your welcome Roger!! 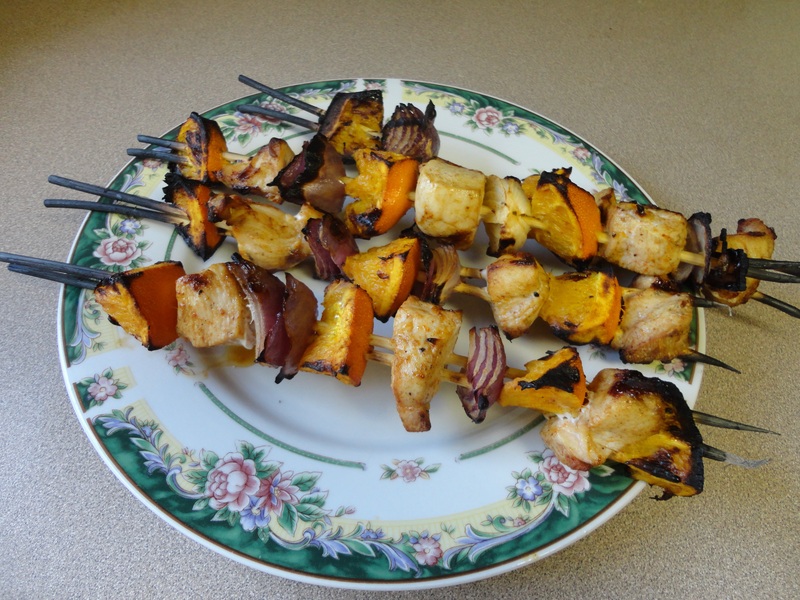 Most of the vitamin-C in those oranges on the skewer, are in the orange peel. We are celebrating Mid-summer (summer soltice) this weekend in Sweden. It is our longest day of the year. There is a lot of Swimming,dancing, singing, drinking and excellent dining. I am opting for the non traditions main dish. I wanted meat and vegtables on skewers. I usually have cherry tomatoes, mushrooms, egg plant as well on them. Thanks for the different version. It sound great. I am glad you like the recipe. Keep in mind you don’t peel the oranges. Just seed them. Did you know most of the vitamin-C is in the peel? I hope you have a good time in your festivals. Thanks for stopping by Honey.